For centuries, women have battled the fight against unwanted body hair. Hot waxes and lotions, razors and threads — you name it, most women have tried it. But one lesser-known method of hair removal is fast becoming a mainstream beauty regimen. Body sugaring has been used for hair removal by Middle Eastern women for centuries and is now gaining popularity in North America — the best part? It’s all natural. Noticing the lack of consistent-quality sugaring pastes as its popularity rose, Sara Pauli, owner of Sugar & Company wanted to use chemistry to develop a superior product for this type of hair removal — one that could be easily reproduced. Sara enlisted the support of PhD researcher Joanne Curiel Tejeda at Western University through the Mitacs Accelerate program for the task. Joanne’s research focused on looking at the molecular structure of the three main components of sugaring paste: sugar, lemon juice, and water, and determining how to manipulate these structures to get the desired results and consistency from every batch. “After a lot of trial and error, we were finally able to take our small batches and produce them at a much larger scale, while maintaining the high quality and integrity of the paste so they could be sold wholesale to spas,” says Joanne. The next step of their research will be to commercialize the truly all-natural product for women across the country to buy at their local drugstore for home use. As a graduate student, Joanne says the Mitacs program gave her the opportunity to apply her organic chemistry knowledge in a practical setting — running her own lab and applying science for industry. 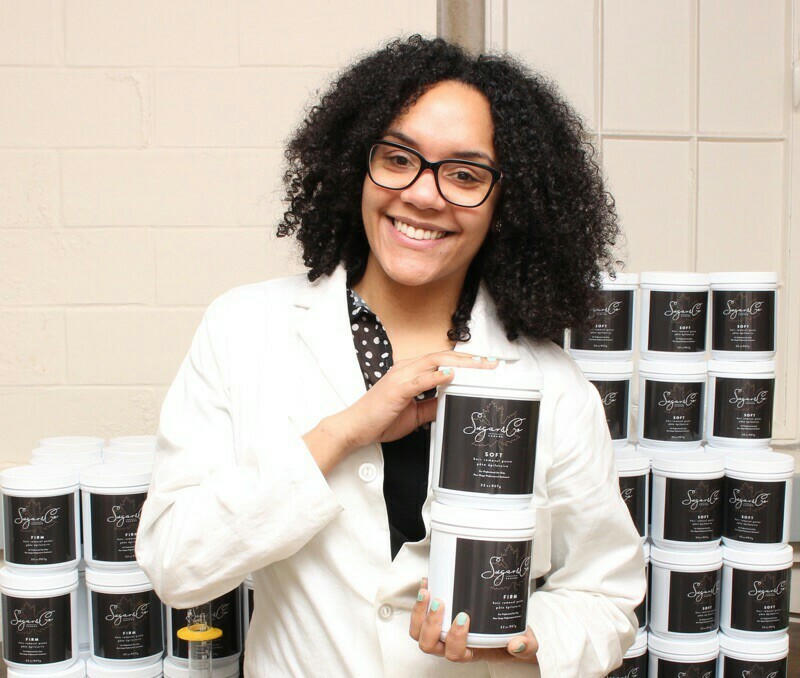 “Working with a local business allowed me the freedom to learn and experiment, all while getting the business and administrative skills needed to run a lab.” In fact, Joanne hopes to continue working with Sugar & Company to commercialize their all-natural sugaring paste – bringing sweet hair removal to the homes of women across the country.